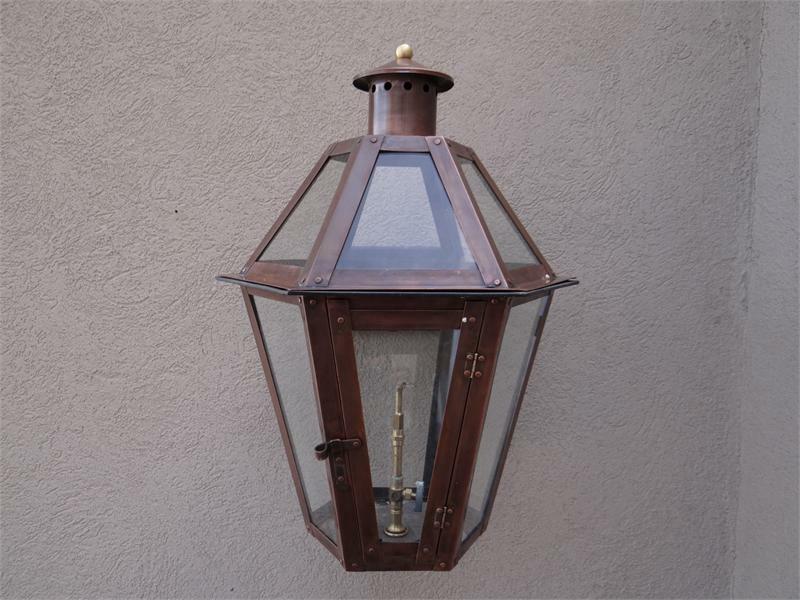 GL23 RegencyPoydras Model Gaslight, Includes Wall Mount!22.5" x 15"
Home > Browse All Lanterns > Browse By Brands > Regency Series Antique Copper Gaslights > Regency Series Antique Copper Lights > GL23 RegencyPoydras Model Gaslight, Includes Wall Mount!22.5" x 15"
The Regency Poydras model gas light is a truly unique gaslight with six sides! Standing at 22 1/2" Tall X 15" Wide x 16" Deep with wall bracket. This light adds exceptional ambiance to any location. These gas lights are all hand-made of copper materials with brass details, meticulously cut and riveted with exacting standards. These lights are also CSA certified for safety and durability. They include solid brass control valves for variable flame settings and years of dependable use. Each light includes tempered glass panes. Consider adding an automatic ignition system. Add AIM 20 below. Other features include the antique (copper) finish, hand door latches, AND brass details. These lights are shipped for natural gas unless you specify LP. Finally, this light INCLUDES ,at no additional charge, a wall mount similar to the Regency Bracket shown above.